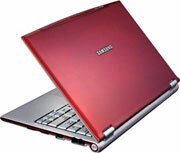 – CNET Asia – December 2005 – (US$2,347.66) certainly doesn’t make for a very affordable notebook but the Q30 clearly wants to target the higher-end segment of the market. – TrustedReviews – January 2005 – 8 out of 10 – TrustedReviews.com “Recommended” – If youâ€™re looking for a very light and slim notebook to carry around with you all day, every day, youâ€™d be hard pushed to find a better unit than the Samsung Q30. Just make sure that you donâ€™t need PC Card or Bluetooth support.